New Mexicans beware – we’re quickly warming into snake season. Last year, the New Mexico Poison and Drug Information Center reported nearly 100 cases of snake exposure in 23 of 33 New Mexico counties mostly between May and September. Almost 80 percent of those calls were rattlesnake encounters. 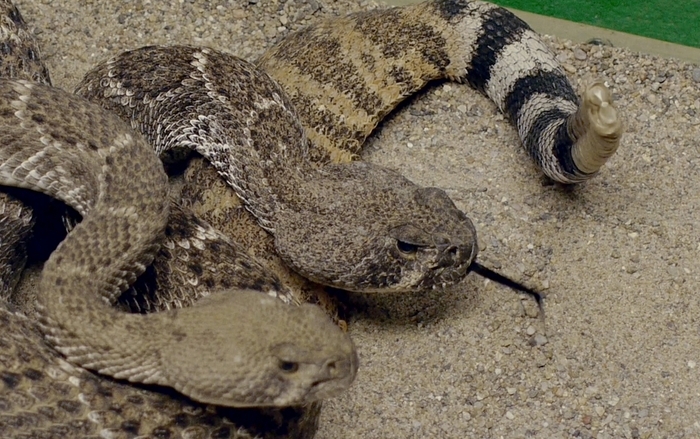 Venomous snakes found in New Mexico include rattlesnakes and coral snakes in the southwest part of the state. Venomous snakes can be especially dangerous to outdoor workers or people spending more time outside during the warmer months. Most snakebites occur when people accidentally step on or come across a snake, frightening it and causing it to bite defensively. Avoid surprise encounters with snakes: Snakes tend to be active at night and in warm weather. They also tend to hide in places where they are not readily visible, so stay away from tall grass, piles of leaves, rocks and brush, and avoid climbing on rocks or piles of wood. When moving through tall grass or weeds, poke at the ground in front of you with a long stick to scare away snakes. Watch where you step and where you sit when outdoors. Shine a flashlight on your path when walking outside at night. Wear protective clothing: Wear loose, long pants and high, thick leather or rubber boots when spending time in places where snakes may be hiding. Wear leather gloves when handling brush and debris. Never touch or handle a snake: Never handle a snake, even if you think it is dead or nonvenomous. Recently killed snakes may still bite by reflex. There have even been cases of detached snake heads being able to bite, reflexively. ​Bring a partner: If you are planning to spend time in a snake-prone area, it is best not to go alone in case you are bitten by a snake or have another emergency. If you must go alone, make sure you bring a fully charged mobile telephone and stay wherever your phone gets a signal. WHAT IF YOU ARE BITTEN BY A SNAKE? Do not panic; keep still and calm. Call the poison center immediately at 1 (800) 222-1222. Our experts have been specially trained to treat snakebites. Every snakebite is different, and the poison center specialist will tell you what you need to do next, based on your specific situation. If you need immediate medical care, the poison center specialist can tell you where to go and call ahead to the right medical facility to ensure you get the care you need, quickly. If the person who was bitten is having trouble breathing or losing consciousness, call 911 immediately. If you are in a remote location and do not have mobile phone service, ask someone to drive you to the nearest emergency medical facility. Only drive yourself as a last resort. Call Poison Help at 1 (800) 222-1222 as soon as you have telephone service. Keep the part of your body that was bitten straight and at heart level, unless told otherwise by the poison center specialist. Wash the bite with soap and water, and cover the bite with a clean, dry dressing – if available, and if doing so does not cause delay. Being able to describe the snake to medical professionals can help them decide on the best treatment, so try to remember the color and shape of the snake, but don’t move closer to it. Only take a photograph of the snake if you can do so from a safe distance. You do not need to bring the snake with you in order to get the proper medical treatment. Do not pick up, attempt to trap, or kill the snake. Do not apply a tourniquet or attempt to restrict blood flow to the affected area. Do not cut the wound. Do not apply heat, cold, electricity or any substances to the wound. Do not drink alcohol or caffeinated beverages or take any drugs or medicines. “Remember, too, that the summer months bring insect and scorpion stings, exposures to toxic plants and mushrooms, pesticides, and outdoor entertaining hazards,” Seifert adds. For more outdoor poison prevention tips and resources, visit The New Mexico Poison and Drug Information prevention tips or visit the American Association of Poison Control Centers Outdoor Poison Safety site.